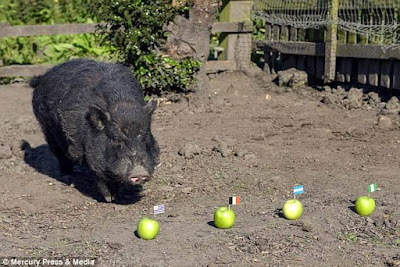 The black pig had previously guessed the winner of the 2014 World Cup and the Wimbledon tennis finals by picking apples. And the eight-year prophet even predicted Brexit and that Donald Trump would win the presidential election in the United States. Now, Mystic Marcus is putting his skills to the test by predicting the semi-finalists for this summer's World Cup in Russia. With bad news for fans of England, Mystic Marcus hopes that Belgium, Argentina, Nigeria and Uruguay will surpass him. The Juliette swine farmer and pig breeder in Heage, Derbyshire, said: 'Marcus is the seventh child of a seventh child and they are apparently endowed with special powers, so maybe that's where it comes from. 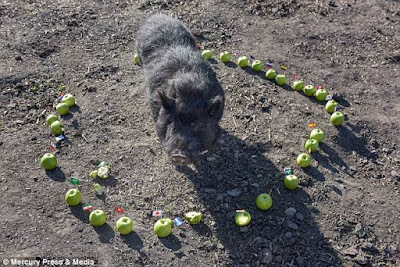 "A few years ago, I was invited to a radio show because of the prediction results of Paul the Octopus and they wanted to see if I had any animal that had the ability. "I had not tried the seventh child theory, so I thought I'd try it. "They used apples and oranges and Marcus predicted the results of football, it was incredible." Juliette, 50, said after that first result that they changed the method to make it more scientific. Now, Mystic Marcus, who has about 30 children and grandchildren, will choose apples of a similar size and color to be as fair as possible. The apples will include markers, like images or flags, and Marcus will gobble the winner.